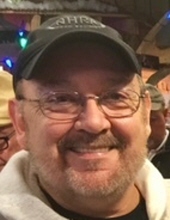 Danny L. Wygant, age 67, of Harborcreek, passed away at the Cleveland Clinic on Thursday, April 4, 2019, following a brief illness. He was born in Erie on September 6, 1951, son of the late Milton and Betty (Miller) Wygant. Danny was a 1971 graduate of East High School. After graduation, he enlisted in the U.S. Army National Guard and was honorably discharged in 1977. Danny was employed by Zurn Industries for 20 years and was retired from Amthor Steel after 25 years of service. He was a member of the East Erie Moose Lodge. Danny enjoyed fishing, especially with his late son, Michael, and loved travelling extensively with his family. He was an avid Pittsburgh Steelers fan. In addition to his parents, he was preceded in death by his beloved son, Michael A. Wygant on December 1, 2018 and three brothers: Gerald, Donald and David Wygant. Surivivors include his wife of 47 years, Sharon L. (Daniels) Wygant; his daughter, Lisa Garczynski (Andrew); three brothers: Scott Wygant, Dale Wygant (Kathy) and Eric Wygant (June) and several cousins, nieces and nephews. Family and friends may call at the Dusckas-Taylor Funeral Home & Cremation Services, Inc., on Wednesday from 2 to 4 and 6 to 9 p.m. and are invited to attend the funeral service there on Thursday at 10 a.m. The Rev. David Roach of Harborcreek Baptist Church will officiate. Danny will be laid to rest at Wintergreen Gorge Cemetery with full military honors. Memorial contributions may be made to the American Heart Assoc., 3025 French St., Erie, PA 16504. To send flowers or a remembrance gift to the family of Danny L. Wygant, please visit our Tribute Store. The Rev. David Roach, Pastor of Harborcreek Baptist Church, will officiate. "Email Address" would like to share the life celebration of Danny L. Wygant. Click on the "link" to go to share a favorite memory or leave a condolence message for the family.